This is Part I of a three-part series on the working conditions and treatment of immigrant forestry workers. Any Oregonian who watches network television is probably familiar with periodic campaigns of state-sponsored ads boasting “strong laws” in Oregon that require replanting after logging and other healthy-forest management practices. These ads are paid for by taxes collected from the timber industry and broadcast on its behalf. For the past three decades, Oregon’s timber and forestry sectors have been hoisted up on the backs of thousands of immigrant and guest workers from Latin America. But language barriers and the isolated nature of their work have kept them out of public view, have given them little recourse for workplace violations and have made them susceptible to widespread exploitation. That was the sobering message delivered by immigrant workers and their advocates before the governor’s Environmental Justice Task Force in September. The testimony has drawn the attention of Oregon’s top industry regulators, Bureau of Labor and Industry Commissioner Brad Avakian and Oregon Occupational Safety and Health Division Administrator Michael Wood, both of whom are joining the task force’s continued discussion Feb. 5 around issues facing immigrant forestry and farmworkers. For first-generation American Joel Iboa, forestry and sawmill work has been his family’s legacy. He grew up with relatives who were missing body parts and suffering the health effects of working in Oregon’s forests, sawmills and fields. He listened as his aunts and uncles told what he described as horror stories about accidents out in the forest and gross mistreatment of workers; sometimes they laughed while he sat quietly in disbelief. 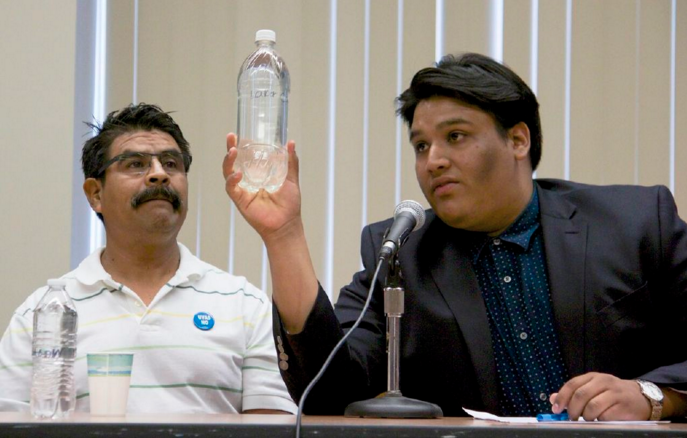 Joel Iboa holds up a bottle of murky water, showing the governor’s Environmental Task Force in September what immigrant laborers are drinking at a labor camp near Medford. Seated next to him is Dagoberto Morales, founder and director of Southern Oregon Center for Farmworker Advocacy. Iboa’s family immigrated to Oregon from rural areas of Zacatecas, a state in North Central Mexico known for silver mining and agriculture. The economy in Zacatecas is seasonally driven and weather dependent; no rain means no money. His father, Joel Iboa Montes, came to Medford in the mid-1980s just after turning 18. The middle child of nine siblings, he had followed his older brothers north with dreams of going to college. He arrived on a Saturday night in the middle of winter. The following Monday, his brothers woke him before sunrise. They would be “pulling trees” that day. It was cold. Montes was used to the temperate 80-degree winters of Central Mexico. The day was spent pulling saplings from the frozen earth for later replanting in the forest. The rubber boots and gloves he wore didn’t keep out the frigid cold. By the day’s end, his hands were bleeding and his body ached so badly he could barely move. In Mexico, he planted crops – beans, squash and corn. He had raised livestock as a ranch hand. He had been pulling trees for a month, miserably, when his brothers came to him with news of a job change. He planted trees off and on for the next five years. Because many reforestation workers have families to feed and few other options given their immigration status, they keep their heads down and their mouths shut, out of fear of being blacklisted from the industry for reporting commonplace on-the-job injuries, dangerous working conditions and wage theft. They pile into vans before dawn to travel – sometimes for several unpaid hours – to worksites in forests across the Pacific Northwest. They carry 50-pound bags full of saplings, often on steep inclines during winter months, planting more than 40 million trees each year. They swing chainsaws and spray herbicides – in many cases with no formal training. At night, far from home, they are commonly put up in motel rooms where the bodies outnumber the beds. When they’re working on public lands, tax dollars pay their wages as they fulfill government contracts. They don’t work directly for timber companies and government agencies, but for the hundreds of small companies across the state that win reforestation contracts – removing liability from the government or timber industry. Montes found time to take English classes between jobs, practicing with his site supervisors when he could. It helped get him and his brothers work at a sawmill in Monroe. It was stable, but not better, he said. As in reforestation, many jobs in today’s sawmills are also filled by immigrant workers. One day while he and his brothers were working at the sawmill, the youngest of the clan got his jacket caught in a chipper. His arm was pulled into the machinery, tearing it off his body at the shoulder. He was only 19. “It was an accident that could have been avoided,” said Montes, adding that a protective cover that should have prevented the amputation was missing. He had to retrieve his little brother’s mangled arm from the machine after the incident. About 20 years later, in January 2015, Oregon Occupational Safety and Health cited that same mill for 15 violations after two inspectors toured the facilities. In addition to missing flooring and railings near dangerous machinery, they found employees were applying a fungicide to wood that can cause blindness without any facial protection or training, let alone gloves. There was no eyewash available in case of emergency. Iboa watched his uncle try to get by with only one arm. An undocumented immigrant, he was never eligible for disability benefits and struggled to find work. He shudders to think he still has family at work in that mill. Another uncle is missing fingers from years of farm work. Iboa said his grandfather’s brother, well into his 70s with no retirement money, continues to work long days in the peach orchards near Medford. His aunt told stories of being sprayed directly with pesticides while working in strawberry fields. And now, Iboa said, he’s watching cousins his age fall into those same lines of work. Montes said it makes him furious to watch his nieces and nephews doing the manual labor that he made certain his own three children would never have to do. The Northwest Forest Worker Center has been advocating on behalf of reforestation workers since 1997. Headed by Carl Wilmsen, the nonprofit has offices in the Bay Area and Medford. A survey conducted by the center in 2012 gives a glimpse into just how frequent these workers are denied basic rights, such as water and rest breaks, and how often their supervisors short them on pay. Staff at the center interviewed 150 workers in Jackson and Josephine counties in Southern Oregon. Those workers included employees from exactly half of the 42 reforestation contractors operating in that area. Forty-eight percent of workers reported that they don’t get paid time and a half when they work more than 40 hours in a week, and 45 percent said they’ve been shorted on pay during the year leading up to the survey. One in eight said it happened more than six times. Additionally, only 39 percent reported receiving safety training. When they did get training, it was often just a few minutes. Despite the rigorous nature of their work, sometimes in extreme heat, more than three-fourths of the survey respondents reported never getting rest breaks and the same amount reported that they didn’t always get a lunch break. More than half reported the contractor they worked for did not always provide drinking water, with 10 percent saying they drank from mountain streams, putting them at risk of contracting E. coli or giardia. In November, Oregon OSHA announced it was awarding the Northwest Forest Worker Center $40,000 to combat heat-related illnesses among forestry workers by educating workers about their right to take breaks and the importance of hydrating. When asked why a government regulator is awarding money to teach workers how to stick up for themselves rather than enforcing the laws that already exist to protect them, Wood, OSHA’s administrator, said that money was earmarked for grants only, so it couldn't be redirected toward enforcement. The number of inspectors working for OSHA is set by legislature. Wood said over the past 20 years, Oregon OSHA enforcement has been cut in half. Today, there are 48 safety inspectors and 28 health inspectors for the entire state. They inspect 3 percent of workplaces each year. But, he said, the more dangerous the job site, the more likely it is to be inspected. Between 2011 and 2015, an average of 14 of Oregon’s 284 reforestation employers were inspected each year. The majority of contractors over that five-year period were found to be noncompliant, and citations issued were consistent with data collected by the Northwest Forest Workers Center. Wilmsen said the center hears a lot of complaints from injured workers whose employer told them to lie at the hospital about how they were hurt in an effort to avoid workers’ compensation claims. Street Roots asked Jennifer Flood, the state’s ombudsman for injured workers, if this scenario sounded familiar. “Unfortunately yes, it does,” she said. While it isn’t a forestry-specific problem, she said forestry workers are more vulnerable to it. Forest workers who initially lied about their injury typically call her office because they are having trouble paying bills when the injury is lasting longer or causing them to miss more work than expected. She said lying about the cause of an injury upfront can be detrimental to the outcome of the claim. Between 2010 and 2014, there were 556 accepted disabled workers’ compensation claims filed by forestry workers, but with many fearful of filing, that number is likely a drop in the bucket. With inadequate government oversight, forestry workers’ family members are fighting for improvements. In the Medford area, a small group of women goes door to door, looking for workers. They go to the general store, where they buy hard hats and boots, and to the laundromats and markets on weekends. They call themselves the “Promotoras,” or promotion girls, and they are the wives, aunts, sisters and mothers of past and present forestry workers. The Promotoras outreach is a program the Northwest Forest Workers Center. They distribute fliers with information about workers’ rights and resources, and they offer training on accident prevention, chainsaw safety and how to survive outdoors. They give workers booklets to record the hours they work. Since 2011, they’ve trained more than 300 forest workers on how to stay safe on the job. All four women Street Roots spoke with relayed various tales of worker abuse they have heard from their husbands and the men they train. From shoddy camping conditions and rotten food to dangerous working conditions and wage theft, these women are well-versed on the abuses within Oregon’s forests. “If you go and ask the workers, just one out of every 40 or 50 is going to say they’re not being mistreated. No one is going to tell you that they’re being treated fairly,” said Promotora Erika. “The way you see your husband when they come back from planting trees – they’re hurt,” she said. Through a translator, Promotora Matha said her husband once broke his big toe when a tree crushed it. The crew wasn’t scheduled to leave the worksite for 15 more days, and his supervisors made him work on his broken toe until the job was done. During that time, it became infected. Both Erika and Martha asked that Street Roots omit their last names because their advocacy could affect their family members’ ability to find work, they said. Even for the Promotoras, it’s difficult to get workers to talk. Promotora Gladiola Garcia said, with the help of a translator, that one time a foreman had the Promotoras chased away from a motel where workers were staying. Other times workers told her they wanted to speak to her but couldn’t because their boss was nearby. Supervisors have thrown out their pamphlets after they leave, and workers have told them they could be fired just for listening to them. The Promotoras often visit motels where H-2B workers are housed. These workers are typically from Mexico or Guatemala. They are granted temporary, seasonal visas to visit the U.S. for work. They don’t speak English, and sometimes they don’t speak Spanish either, but indigenous languages, making them particularly susceptible to exploitation. In 2013, there were more than 800 forestry and conservation positions open to these guest workers across the state. At of the start of 2016, the U.S. Forest Service in Oregon and Washington had 104 active contracted operations staffed by guest workers, totaling $9.5 million. Lately, said the Promotoras, guest workers seem to be getting younger. “What we’ve seen recently is many, many young 18-year-olds are coming out, and they know nothing; they have no sort of training,” Camberos said. Some workers have told the women that their supervisors hold their visas hostage the entire time they are in the U.S. and that they treat them like animals, Erika and Camberos said. The Promotoras said that for years, many forestry workers have been reluctant to speak up for their rights, but now, as they see their sons and nephews take jobs in the forest, they have become motivated to change the industry. Iboa credits his father’s hard work and encouragement for his own ability to break free from what he calls the “perpetual cycle” many of his cousins are caught in. “I escaped it because I went to school,” he said. He began to see a bigger picture while studying sociology at the University of Oregon. Organizing with the campus MEChA chapter and learning about environmental justice, he said he began to think about his family. He began to think about how they all went to work under dangerous conditions, exposed to toxic chemicals with little protections. But when they came home, the exposure didn’t stop – he, his uncles and cousins all lived in the most polluted areas of West Eugene. About a year ago he saw a Craigslist ad for an opening at an environmental advocacy group in Eugene called Beyond Toxics. One thing on its agenda was protecting farm and forestry workers from harmful pesticides and herbicides. “I knew this was my job,” he said. Now, at age 24, he’s been the environmental justice and community outreach manager at Beyond Toxics in Eugene for one year. As he’s learned more about the effects of herbicides and the toxic chemicals used in sawmills, he said, he can’t help but wonder if his mother was washing his father’s clothes with his baby clothes years ago – or if the exposure could have had an effect on her pregnancy with him. On Feb. 5, he will go to Salem to listen as state regulators discuss worker issues he’s helped bring out of Oregon’s forest and fields and before members of the governor’s Environmental Justice Task Force. The task force first heard testimony from immigrant forestry and agricultural workers, the Promotoras, Iboa and Wilmsen in the fall. Workers testified they were exposed to toxic pesticides and herbicides and believe they have health problems such as liver, kidney and nervous system damage as a result. They testified about not getting breaks, retaliation for complaining and having only dirty water to drink. At the following task force meeting in December, Iboa urged members to take action rather then wait to see if proposed EPA pesticide application rules get approved. “Why can’t Oregon have something more robust – and enforcement of existing laws?” he asked. Iboa and his colleague, Beyond Toxics Executive Director Lisa Arkin, see the presence of BOLI’s commissioner and OSHA’s administrator at Friday’s meeting as a monumental step in their effort to protect forestry and farmworkers from dangerous exposure toxics and to combat workers’ fear of retaliation in reporting their injuries. Beyond Toxics signed off on a letter, along with Oregon Action, Northwest Forest Workers Center and farmworker activist groups PCUN and UNETE, asking the task force to bring their requests to Gov. Kate Brown, as changes to the system that perpetuates worker abuses will need to come from the top down.